There will come a point where we need to enter or exit recovery mode. Especially when iPhone gets stuck in Apple logo, iTunes logo, and boot loop after iOS update or jailbreak, we have to restore our iPhone using recovery mode. Recboot is a famous free software that enables users to enter recovery mode in only one click without manually operations and exit recovery mode easily without iTunes restore. In this article, we will show you how to download RecBoot 2017 for Windows 10/8/7 and offer a RecBoot Alterative to enter and exit recovery mode when RecBoot not working. You can download Recboot from any of the various online sources, since it is available for free and the installation process is absolutely similar like any other freeware. What you need to do is making sure the site is a safe one because some of the online sites might contain malware. Note: RecBoot 2017 has not been known to work on Windows 10/8/7 64 bit. Extract contents from the downloaded Zip file and install it on your computer. Run the software and connect your iPhone, iPad, iPod touch to computer. 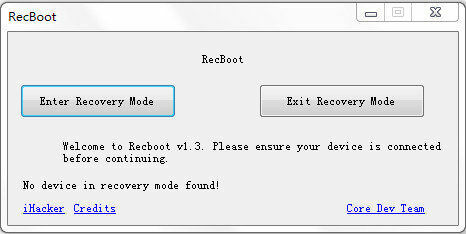 RecBoot window will show you two options: Enter Recovery Mode and Exit Recovery Mode. After your device is recognized, click "Enter Recovery Mode" to put iOS device into recovery mode. Or click "Exit Recovery Mode" to get iPhone out of recovery mode stuck. RecBoot not working? We have heard lots of users reported that RecBoot doesn't recognize iPhone, not working in exiting recovery mode after installation recently, or even fails to start due to RecBoot qtmlclient.dll is missing. In this case, Free Tenorshare ReiBoot, the best RecBoot alternative 2017 for Windows 10/8/7, will be a perfect choice for you. It does what RecBoot does and so much more. With it, you can easily enter or exit recovery mode in 1 click and fix all kinds of iOS stuck issues including black screen of death, white apple logo and any operating system related problems without restoring or losing data. Free download and install free Reiboot on your computer and connect your iPhone/iPad/iPod to a Windows PC. To put iPhone, iPad or iPod into recovery mode, after Tenorshare ReiBoot detects your device, click "Enter Recovery Mode" to get your device into Recovery Mode. To get iPhone, iPad or iPod once your device is detected, click "Exit Recovery Mode" to fix your stuck iPhone. If your device is still stuck in Recovery Mode, white screen, black screen and Apple logo loop, you can use "Fix All iOS Stuck" feature on Tenorshare ReiBoot to. Choose "Fix All iOS Stuck" in the main interface and then click "Fix Now" and follow the wizards to put your device into recovery mode or DFU mode to get your device detected. Once your iPhone is detected, download the firmware package matching for your iPhone. It will take some time since the firmware package is around 2.5 GB. That's all for how to download RecBoot 2017 for Windows 10/8/7 and get the best RecBoot alternative 2017 when RecBoot not working. We hope our solution would help you solve your problems.